The declaration of a six-month state of emergency is a major development, as Ethiopia hasn't declared a state of emergency for decades. However, the government has been increasingly rattled by growing anti-government protests, especially among the marginalized Oromo ethnic group, which comprises 34% of Ethiopia's population, and among the Amhara ethnic group, which comprises another 27%. The government is largely controlled by the ethnic Tigrays, who are a market and government dominant minority, comprising only 6% of the population. They are extremely authoritarian and have succeeded in marginalizing the other ethnic groups, and are said to have informants in villages throughout the country. The state of emergency was declared following a thorough discussion by the Council of Ministers on the loss of lives and property damages occurring in the country. We put our citizens' safety first. Besides, we want to put an end to the damage that is being carried out against infrastructure projects, education institutions, health centers, administration and justice buildings. A state of emergency has been declared because the situation posed a threat against the people of the country. The emergency will not breach basic human rights enshrined under the Ethiopian constitution and won't also effect diplomatic rights listed under the Vienna Convention. The state of emergency will help restore peace and security shortly. It is also intended to smooth the progress of the efforts being made to resolve the problem peacefully." The government considered the state of emergency to be necessary following violence at a peaceful protest last week. Dozens to hundreds of ethnic Oromo people were killed last Sunday (2-Oct) when security officials used teargas and gunshots to disperse protesters at the Oromos' annual Irreecha thanksgiving celebration in the town of Bishoftu. These actions triggered a stampede among the tens of thousands of people peacefully protesting against the government, resulting in the deaths. The Oromos are the largest ethnic group in east Africa, and make up 34% of Ethiopia's population, where they are split approximately evenly between Christianity and Islam. Most of them live in the Oromia region, which surrounds the capital city Addis Ababa. Addis Ababa is a major metropolis, and it has been growing and expanding. Last year, the government announced a plan to expand Addis Ababa into Oromo farmland, which triggered large scale protests. Massive protests in December 2015 caused the government to back down on the plan, but the protests have continued, because of deep poverty among the Oromos and what they see as marginalization. The kebeles are the smallest unit of local government in Ethiopia, and exist throughout the entire country, in both rural and urban districts. When the USSR-dominated communist government, known as the Derg dictatorship, was in charge prior to 1991, they were used by the government to exert local control. As I described recently in the Generational history of Ethiopia and Eritrea, Ethiopia's last generational crisis war occurred in 1991, when the Derg dictatorship was overthrown. The new constitution promised human rights for everyone. Theoretically, the kebeles were then to become a democrat way of devolving central government power to the local authorities. "While originally intended to help implement the Derg�s ambitious rural development agenda and land reform program, the kebele system quickly evolved into a highly effective mechanism of control and repression. Kebele officials were expected to keep their communities under perpetual surveillance and to report any subversive activities to higher authorities. The kebeles were also used to disseminate government propaganda, implement government policies and maintain general order and discipline. When the EPRDF came to power it retained the kebele as the smallest unit of local government throughout Ethiopia and has continued to use the system to consolidate and extend the power of the ruling party. In Oromia�s rural areas, kebele officials wield a great deal of power over the populations they govern. Most of the region�s rural population consists of subsistence farmers who depend upon kebele officials to provide them with a range of essential services and agricultural inputs. Perhaps most significantly, kebele officials distribute fertilizer to farmers throughout Oromia on credit and are responsible for collecting those debts when they come due. Farmers must also obtain letters from kebele officials verifying their identity and place of residence when they wish to access government services outside of their communities. Such letters are usually required, for example, in order to visit a doctor or send one�s children to secondary school in town." Ethiopia is now in a generational Awakening era, and as I've described in Syria, Burundi, and other countries, these are times when anti-government protests only grow, and if the government is sufficiently paranoid, then these peaceful protests are met with increasing violence by government security forces. 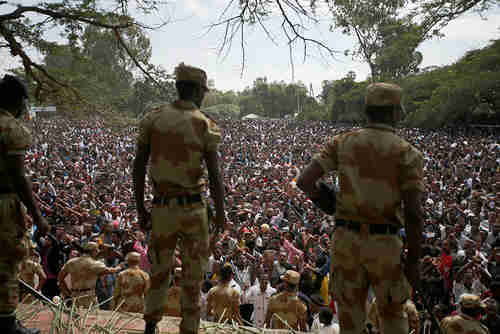 These protests are only going to increase, possibly sending Ethiopia into an increasing spiral of government violence. The Huajian Group, a major Chinese shoe manufacturer, and the manufacturer of Ivanka Trump's shoes, is considering moving part of its manufacturing business from China to Ethiopia, to take advantage of workers who are paid lower wages.